Usually based on Bluetooth Low Energy (or Bluetooth Smart), beacons are broadcasting IDs or URLs, so that an intelligent device (typically a mobile phone) can react on the data when detected. 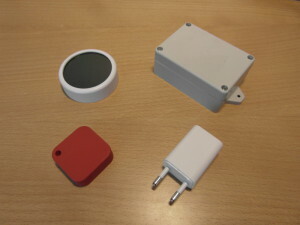 The beacon’s data is sent continuously usually at an interval of 1 second, depending on what responsiveness is needed for a certain situation. The power level of the BLE radio can usually also be controlled, to provide a trade-off between detection distance and battery drain. Not all beacons are battery-powered though. There are USB and power supply variants available as well. In theory BLE can reach 100 meters, but is very sensitive to obstructions, so it’s enough with some metal or water in between the beacon and the detecting device to lower that distance considerably. Even at full power, don’t expect more than 20-30 meters in a practical setting. Almost all deployed beacons use iBeacon. Eddystone comes second, and then mainly transmitting URLs. There are several providers that have beacons that support either iBeacon or Eddystone in the same device. As the focus is access and interpretation via mobile phones, uses are typically in situations where people move around, e.g. in retail, exhibits, conferences, museums etc. Abiro provides support for iBeacon and Eddystone-URL (as of yet) in CliqTags. On the site are described more about beacons and uses thereof.